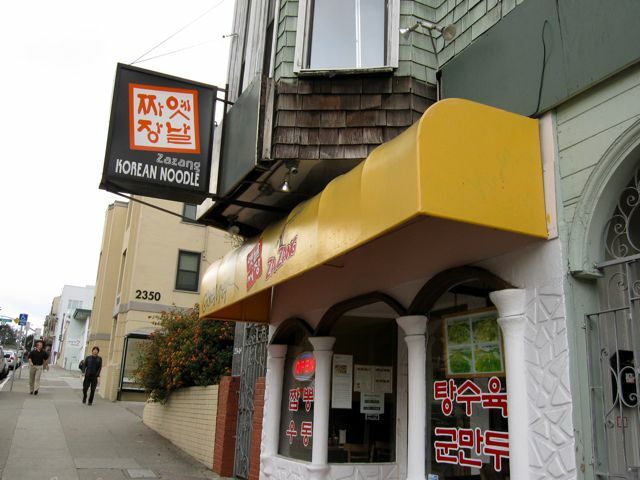 I found this little Korean noodle shop in San Francisco within walking distance of the University of California at San Francisco’s medical offices and a Kaiser Permanente hospital. This section of Geary Boulevard is a busy boulevard with little parking. The nearest public parking is a couple of blocks away at UCSF, which charges $2 for 20 minutes, or $6 an hour. When I came in at 3:30 p.m., I had the place to myself. Customers started arriving around 4:30 p.m.
Jjajamyun (짜장면), typically made with pork, onions and other vegetables, is the restaurant’s signature dish, but I wanted something spicier. I ordered bibimmyun (비빔면, $8.95), which is wheat noodles smothered in a thin, spicy red pepper sauce and garnished with thinly julienned cucumber. My bibimmyun did not come with scissors to cut my noodles, but the woman at a table next to me received scissors for her noodle dish. I could hear the snip, snip, snip as she chopstick-sized her noodles. I ordered ganjajamyun (간자장면, $7.95) to go for my husband. Ganjajamyun is a wheat noodle dish covered in a black bean sauce with beef and vegetables. Zazang’s sauce was not as “glossy” or oily as the stereotype of jjajamyun would lead you to expect. The ganjajamyun for carryout was packed in separate cups for the sauce and noodles. Be careful with storing the noodles and sauce separately in the refrigerator. The noodles got clingy in the fridge, which didn’t affect the flavor but certainly affected the aesthetics of the photo. The banchan, or side dishes traditionally served with the meal, included pickled yellow radish (danmuji), raw onion and a tablespoon of jajamyung sauce. Surprisingly, the banchan didn’t include baechu kimchi, the traditional spicy fermented nappa cabbage version. I wasn’t even asked if I wanted some. The menu has several spicy dishes. Those include gochujapchae (고추잡채, $14.95), which adds zippy red pepper to the popular garlicy, sesame-savory cellophane noodle dish japchae, and me-un gan zazang (매운캄짜징, $8.95), a spicier version of the black bean sauce dish. Adult beverage options include soju, bokbunjaju (raspberry wine) or Hite brand beer. If you find yourself visiting San Francisco and have an insatiable craving for jjajangmyun, this is the first place you should go to quench it. Open every day, 11 a.m. to 9 p.m. I definitely have to check this place out when I visit the Bay Area. I’ve been there driving there for quite sometime now but never really explored the Korean restaurants around the area.